Make your own Easter memory game with the kids using our Easter Egg color and match activity. Print the activity then have the kids identify, then color the matching sets of eggs. Once the page is colored, have them cut out the eggs and paste them on to cardstock (or even easier – index cards). Turn the cards face down and play the memory game. This is a great learning activity for preschool age children. 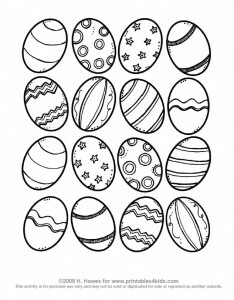 Click on the Easter Egg activity above to view and print full size or download the Easter Egg Color and Match Printable as a PDF file.